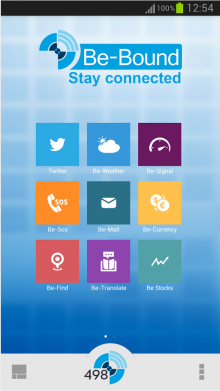 Be-Bound has launched an app for Android devices that promises to keep your connection to the Internet flowing, even when you have no data connection or WiFi available to you. While it might sound like magic, it is in fact a bit more simple than that. The app uses text messages as the ‘transport layer’ for the data, allowing you to keep doing things like checking your mail, or the weather or other local information using its specially made apps. It also works when you do have a data connection too, but is clearly designed to cut back on the costs associated with using data while roaming abroad or for ad-hoc data usage outside of your bundle in your home country or when you have no data coverage. When accessing info via SMS, users need Be-Bound credits called Be-Miles – currently 80 Be-Miles costs £4.68, which is around $7.50 if converted into dollars.